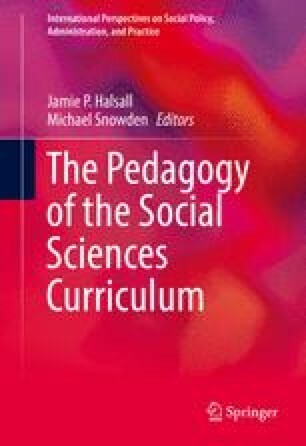 The aims of this chapter are, firstly, to examine the context in which the pedagogy of community arises in the UK and elsewhere, briefly summarising the nature of Higher Education Institutions (HEIs) and then communities themselves. It becomes readily apparent that these are quite different types of entities in their objectives and structures, but it is in their interaction, no matter how complex and difficult, that change becomes possible. We provide some examples of past good practice before focusing on Kahu’s (Studies in Higher Education, 38(5), 758–773, 2013) model of holistic engagement with communities by HEIs. The authors then return to good practice in the current era before concluding with some pointers for the way ahead to a meaningful and productive interrelationship between HEIs and communities. This chapter is based on a presentation to the York HEA seminar on The Pedagogy of Community Development and Engagement in March 2014. The authors would like to thank the organisers Jamie P. Halsall and Mike Snowden and the Higher Education Academy for the opportunity to present their ideas and to the seminar participants for their helpful feedback and comments. Bernal, A., & Ibarrola-García, S. (2014). Learning leadership from teaching: Emotional competences. Multidisciplinary Journal for Education. doi: 10.4995/muse.2014.3265 Social and Technological Sciences. ISSN: 2341-2593. Accessed May 28, 2015.